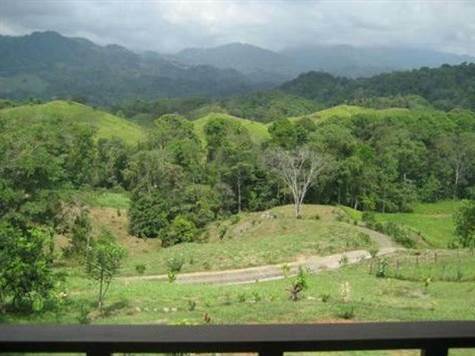 This estate is located in the town of Naranjito, just 20 minutes from Quepos/Manuel Antonio. Set on a flat ridge with views of a small valley and the 8000ft mountain range of Fila Chonta, this acre estate is a masterpiece Enjoy the sun with cool breezy afternoons and fresh nights. This fantastic home, is the perfect location to enjoy nature and the country life of Costa Rica. With South Pacific influences, the home features an exotic blend of high end finishes and eclectic furnishings and the design is the perfect blend of outdoor living and chic design. The bottom level of the home is all open air with a unique design that affords maximum living and entertaining space alongside the 75 foot long pool. There are coral stone columns along with Asian treasures all throughout. Upstairs you will find the main living level which features a gourmet chef’s kitchen with beautiful granite counter tops and slate flooring. The living area is decorated with fine tropical hardwoods. The Master bedroom boasts over sized walk-in closets, an en suite living and TV room and an amazing master bathroom. There is also another bedroom on this floor. The main house is 5000sq. feet and there is also a caretaker’s home with one bedroom, 1 bath, and a kitchen measuring at 1000 sq. feet.